Everything started on March 2. That morning, as I had done every day for almost nine years, I took my place at my desk at 8:20 AM and began work. Except that day was not like any other work day. It was Christmas Day for runners — the New York City Marathon lottery drawing day. 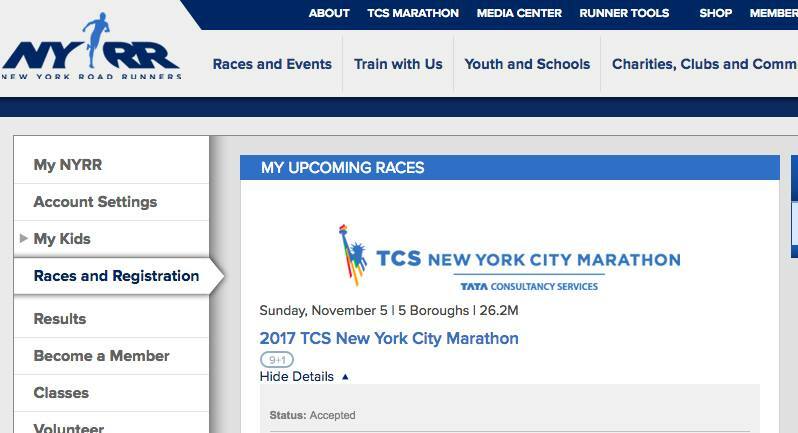 Around 10:00 AM, for the fourth time in as many years, I began the obsessive ritual of checking my credit card activity, my account page on the New York City Marathon website, my email and my phone every five minutes. I knew it was too early in the day for my name to be drawn — New York City metro area residents are the first to be selected, and national applicants such as myself aren’t usually drawn until midday at the earliest — but that didn’t stop me. But by 12:30 PM, nothing had happened. No charge. No change in registration status. No email. No text. I resigned myself to yet another year of watching the race on TV and headed out of the office for my customary lunchtime walk around downtown Syracuse. Even though I knew there was still a good chance I might be selected, for some reason the thought that I would be destined never to run the five boroughs took over, and a gloomy mood set in on my return to the office. Now there was no doubt about it. I was one of the lucky 50,000 who was going to enjoy the thrill of a lifetime and run New York City. Amazingly, as it turned out, that was just the beginning of my good fortune for the month. A little over two weeks later, I was offered a new job after three years of searching. Not only could I now leave my current position for something more creative and rewarding, but this was also the opportunity Tessa and I were waiting for. The job was nominally based out of Rochester, Tessa’s hometown, though it was/is a remote position. The easy part was accepting the job. The hard part was learning a whole new knowledge base. And learning a whole new way to work, without commuting or regular work hours. And moving my apartment, with its nine years of accumulated stuff, 150 miles west. For the remainder of the month, despite it all I tried to carry on with my training, which had been geared to a Memorial Day marathon–Buffalo, most likely, or Burlington again or, if my immigration status allowed (did I mention I was also completing the process of becoming a naturalized citizen at the time?) Ottawa. I even completed my first long run, a halfway decent 16-miler at a 9:27 pace on March 25. I was feeling good. I was feeling strong. The 2015 mojo, so sorely missing from last year, was finally coming back. But by the first week in April, it started to become apparent that something was going to have to give. Something had to be sacrificed for the greater good, and in a hugely ironic twist, just as my body was starting to come around, that something was looking more and more like it was going to be running. That week, I did not run at all. By April 10, I had mostly moved my belongings to Rochester, but there was still some furniture to be disposed of and a whole lot of cleaning to do back at the apartment. I managed a pitiful 21 and 24 miles respectively during the next two weeks–weeks that should be the peak of any marathon training program, weeks when I should have been running in excess of 50 miles per week. And, to add insult to injury, the spreadsheet I always display on my fridge to track my mileage and training progress was packed in a box, never to be seen again. The running gods were clearly telling me something. On the eve of my second Flower City Half Marathon, I made a decision. If I could make it round in under two hours — round the same course where I set my half marathon PR in 2015 — I would continue training as best I could and run Buffalo. If not, I would not run a spring marathon for the first time in four years. This entry was posted in The Flat-Footed Fox and tagged Flower City Half Marathon, half marathon, long-distance running, marathon training, New York City Marathon. Bookmark the permalink.